The Earthworks PM40T Touring PianoMic™ System is a revolutionary solution for miking grand pianos with no mic stands or booms. The PM40T PianoMic™ provides the best of both worlds. A simple piano miking system that takes just minutes to setup and provides incredible results for live performances. Engineered to allow open or closed lid miking, the PianoMic™ is ideal for a wide range of miking situations. In a recording studio with no other instruments, the PianoMic™ shines with the lid open. When in more crowded settings such as on a concert stage shared with other instruments, merely close the piano lid to isolate the piano and minimize leakage. In both scenarios the PianoMic ™will capture the piano with incredible detail. 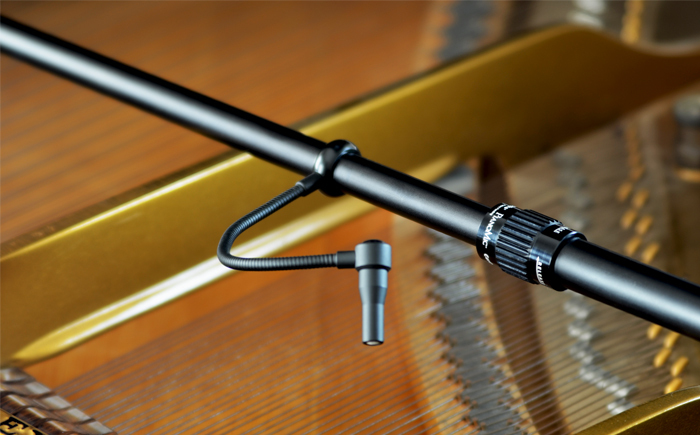 At the heart of the PianoMic™ are two random incidence omnidirectional microphones, specifically designed for use inside of a piano, which is a diffuse sound field. This means that sound is coming at the microphones from multiple sources and multiple directions. A random-incidence microphone is designed to be placed within such a diffuse sound field and pick up sounds uniformly, whether they arrive at the front, the sides or the rear of the microphone. The PianoMic™ System achieves much of its remarkable performance through the use of specially designed, 40kHz random-incidence High Definition Microphones™. Because of the near-perfect omnidirectional polar response of the microphones and extraordinarily tight impulse response, the PianoMic™ picks up every note with consistently. So, the full range of the piano including the high and low strings will be reproduced with no hot spots. In addition, the microphones exhibit no proximity effect, regardless of their distance from the piano strings or soundboard. The mics, when positioned close to the sound source, also provide incredible gain before feedback and can handle up to 148dB SPL. Designed with touring environments in mind, the PM40T takes the incredible performance of the original PM40 PianoMic and houses it in a compact airline friendly carrying case. 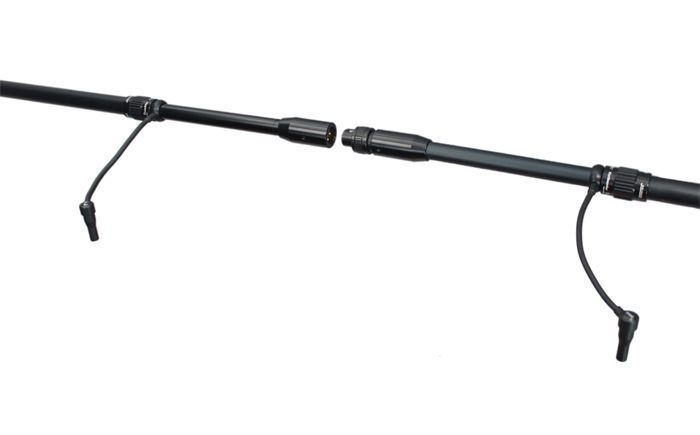 The telescoping bar detaches in the center, making the PM40T much more compact for travel. The PM40T PianoMic™ system mounts within the piano for minimum visibility on stage. 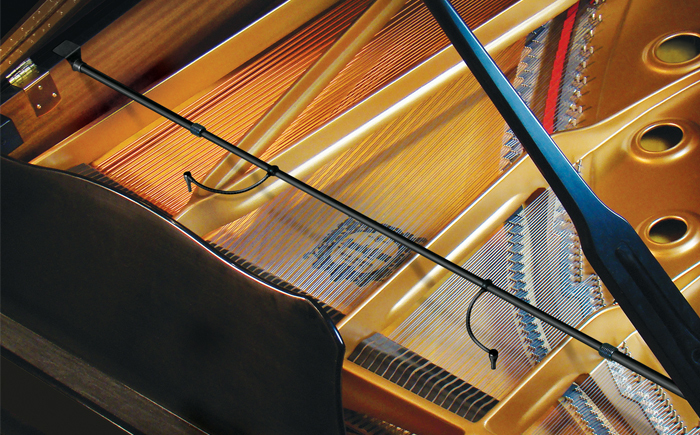 The telescoping bar allows the PianoMic™ to be quickly and easily installed in nearly all grand pianos and to place the microphones close to or away from the dampers and get the exact sound desired. Set on flexible goosenecks, the microphone capsules can be easily repositioned for optimal microphone placement. 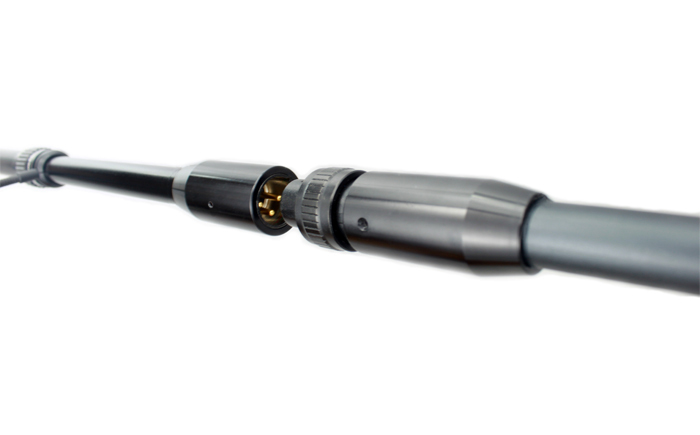 A separate output stage box features a 5-pin XLR input and two 3-pin XLR outputs. 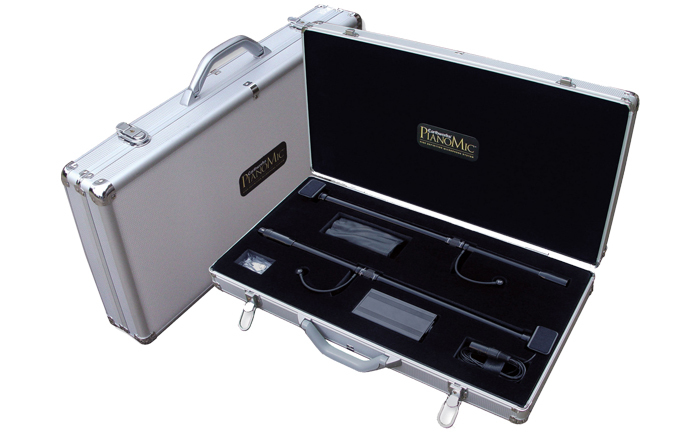 A leather case with a strap allows the box to be mounted onto a piano leg, so the microphone remains nearly invisible from outside the piano or with the lid closed. The innovative PianoMic™ System required the design of unique high definition microphones. Virtually all microphones used for recording and sound reinforcement are “free field” microphones, designed to pick up sounds in front of them. 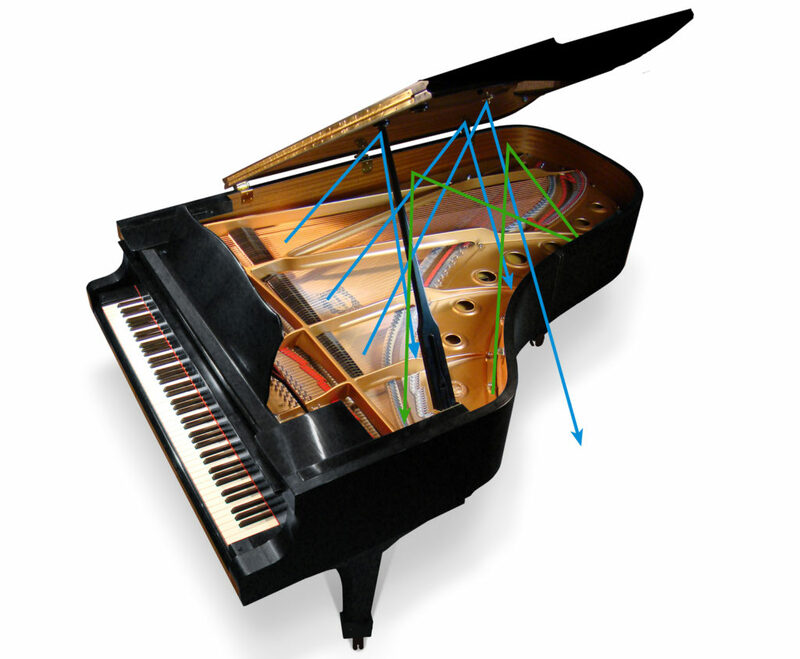 In contrast, the microphones in the PianoMic™ System are actually placed within the sound field of the piano, where sound is coming at the microphones from multiple sources and multiple directions. Each string is a separate sound source and the soundboard is also a sound source. In addition, there are multiple reflections of each sound source from the soundboard, piano sides and piano lid. 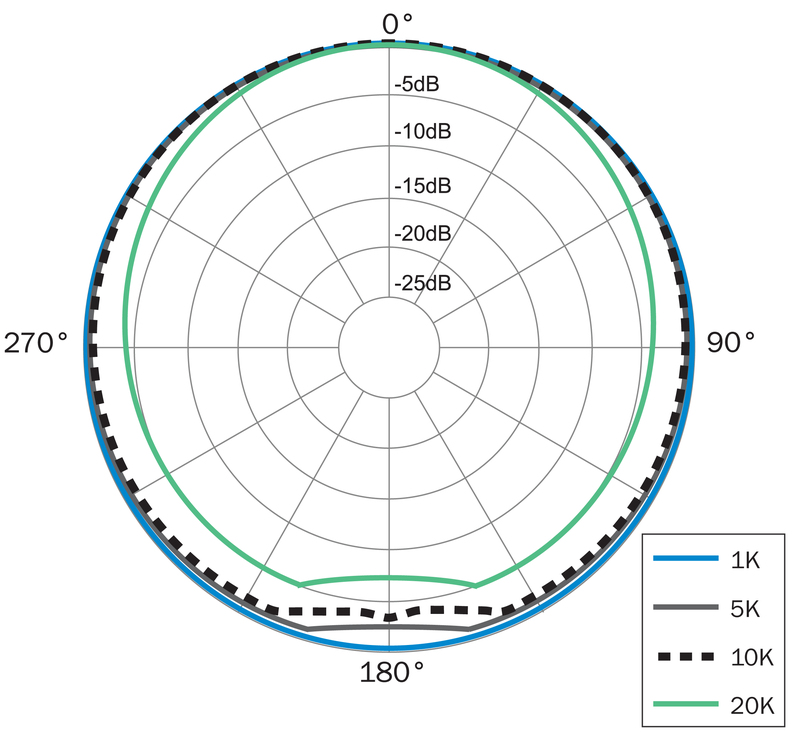 These reflections, arriving from different angles, create what is known as a “diffuse sound field.” A “random-incidence” microphone is designed to be placed within such a diffuse sound field and pick up sounds uniformly, whether they arrive at the front, the sides or the rear of the microphone. The PianoMic™ System achieves much of its remarkable performance through the use of specially designed, 40kHz random-incidence High Definition Microphones™. A lovely sounding microphone that maintains its integrity whether the piano is fully open, on a short stick or fully closed.  This has helped maintain a level of consistency for the show in any situation we have found ourselves in. Be that indoors, outdoors or accompanied by other instruments. Bruce frequently appears on early morning TV shows or other programs where there’s very little time to prepare the piano. For events such as an NBA game, where he performs the National Anthem, we frequently have less than a minute to be ready. By having the PM40 installed inside the piano, we can roll the piano into place, make the cable connections, and be ready to go. If we had to place microphones on stands, we’d never make it. Having the microphones pre-positioned is a huge benefit that ensures we’ll get the sound we want. Live sound reinforcement on a piano has always been a challenge because there is always so much noise onstage and a lot of noise rolling off the P.A. back onto the stage. Once we started using the PM40, we found we were able to run with the volumes we wanted to run at; the tone was amazing and it sounded like a piano. We didn’t have to work to get it to sound that way–you just put the mic in the piano and go.